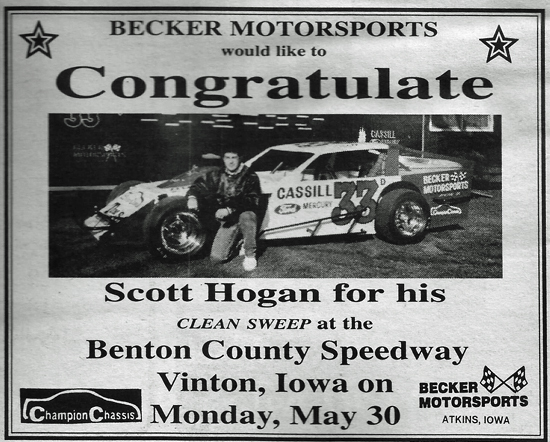 Cedar Rapids, Iowa - Let's take a look back, 22 years ago to be exact, and see who were the winners this week in Midwest racing circles. An impressive and competitive group of 39 IMCA Late Models converged upon Hawkeye Raceway in Bluegrass, Iowa, on Thursday, May 26, and just getting into the feature was a chore in itself as several of the Deery Brothers Summer Series top pilots were forced to watch the green flag drop from the sidelines. Rick Wendling of Hazelton, Iowa, not only made the starting grid but put on a tremendous display of driving in taking the $1,000 victory. 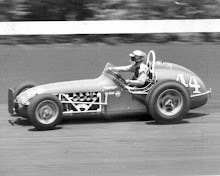 Wendling and pole-sitter Gary Webb of Davenport, Iowa, traded paint for the first 14 circuits before Wendling was able to take command of the race. Webb would make one last charge with 2 laps remaining but fell a few feet short at the checkers. Jeff Aikey of Cedar Falls, Iowa, would take third and Jim Sandusky of Moline, Ill., took fourth. 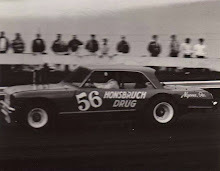 Bob Dominacki of Bettendorf, Iowa, was the hard charger on the day, starting 19th and finishing fifth. Robbie Stanley of Brownsburg, Ind., the three-time defending USAC Sprint Car national champion, suffered fatal injuries in a crash at Winchester (Ind.) Speedway on Thursday night. The race, restarted after the accident, was won by Doug Kalitta of Ann Arbor, Mich. Stanley, 26, was running in 12th place when his car spun coming out of turn four and struck by two other cars, bursting into flames. His death was attributed to multiple trauma. 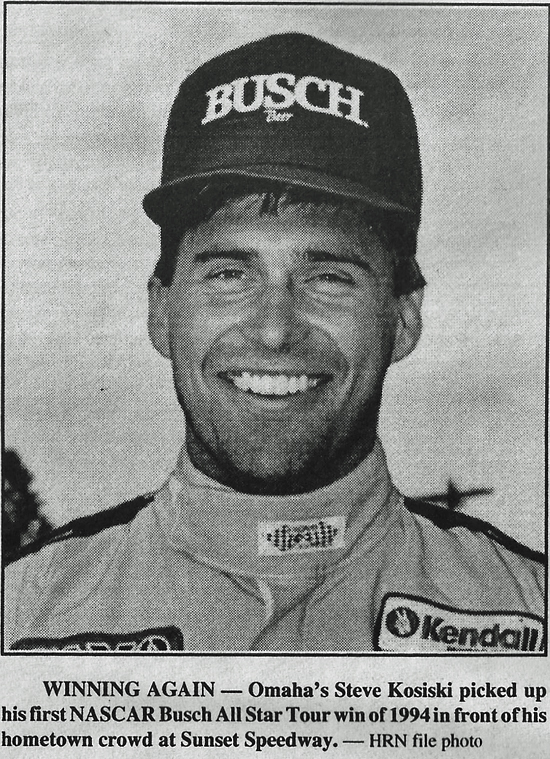 Stanley, the 1991, ’92 and ’93 USAC Sprint Car champion was bidding to become the first ever driver to claim four consecutive titles in the ‘Thunder & Lightning’ series. The IMCA Late Model 25-lap feature turned into a 500-foot drag race with Ron Boyse of Kalona, Iowa, nipping Harry Walker of Washington, Iowa, at the finish line at Louisa County Speedway in Columbus Junction, Iowa, on Friday, May 27. Boyse started eighth and steadily worked his way up front into third. A restart on lap 23 allowed the field to bunch up with Boyse behind Kurt Stewart of Ainsworth, Iowa and Walker. When Stewart attempted to pass Walker on the green flag restart, Stewart slid high allowing Boyse to slip into second place. Boyse would pass Walker on the backstretch and then take the checkers by mere feet. Twenty-two-year-old Matt Kenseth of Cambridge, Wis., continued his early season dominance taking home top honors in the Late Model ‘Coca-Cola 50’ at Madison International Speedway in front a festive holiday crowd on Monday afternoon. Kenseth powered around the outside of Scott Wimmer of Wausau, Wis., for the lead on lap 27 and then cruised to a 3.64 second margin of victory, Wimmer would settle for second, Steve Kenseth of Janesville, Wis., was third, Ron Breese of DeKalb, Ill., fourth and Jason Schuler of Cambridge was fifth. 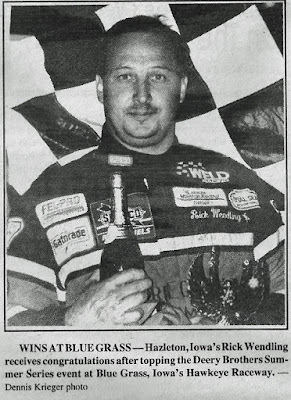 Mother Nature again provided another great night for racing at the Audubon (Iowa) Speedway on Friday night that saw Dennis Pittman of Jamaica, Iowa, capture his second straight IMCA Modified feature. In the IMCA Stock Car feature, Denny Stoneburner of Boone, Iowa, won a close race over Randy Schulte of Auburn, Iowa. In IMCA Hobby Stock action, Mike McClain of Kimballton, Iowa, picked up his first feature win of the season. Curt Martin of Independence, Iowa, posted his second career NASCAR Busch All-Star Tour victory on Saturday night, May 28, at the Hamilton County Speedway in Webster City, Iowa. 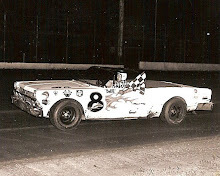 Martin survived a duel with Ed Kosiski of Omaha, Neb., to capture the ‘Jim Dandy 50’ on the half-mile dirt oval. Kosiski finished second but passed his brother, Joe, for first place in the tour point standings. Martin led all 50 laps but encountered numerous laps of side-by-side racing with Kosiski but wasn’t to be denied enroute to his first tour win since a 1987 victory in Freeport, Ill.
Tommy Scott followed his 1993 championship tire tracks on Saturday night, winning his heat, trophy dash and the American Sprint Car Series main event at Tri-City Speedway in Granite City, Ill. The win, his second in a row, cemented his series’ points lead over second-place Butch Nutant, 1,190 to 1,070. World of Outlaws regular Bobby Davis Jr. made a rare visit to Missouri International Racepark in Benton, Mo., on Saturday night and claimed the $3,000 Winged Sprint Car 30-lap feature. Donnie Beechler of Springfield, Ill., would start on the pole and jump out to a commanding lead until Davis caught up and passed Beechler on lap 10. Davis would lead the remaining 20 circuits with Beechler a straightaway behind at the checkers. Gary Hayhurst Jr., of Evansville, Ind., Danny Thoman of Lexington, Mo., and Rod Holshouser of Cape Girardeau, Mo., rounded out the top five. Jim Duchow of Kaukauna, Wis., took the lead on lap 13 and won the ‘Dirt Devil 35’ Mid-American Stock Car Series feature race at Jefferson (Wis.) Speedway on Saturday before the largest crowd of the year. Eddie Hoffman of Westchester, Ill., took runner-up honors while Matt Rowe of Madison, Wis., grabbed third. Bob Pierce of Danville, Ill., took the lead from Mike Jewell on the 33rd circuit and then pulled away to capture the NASCAR Budweiser 75-lap special and a $5,000 pay day at Tri-State Speedway in Haubstadt, Ind., on Sunday evening. Rick Aukland of Fargo, N.D., set fast time of 14.053 seconds. For Al Humphrey of Gilmer, Neb., it was a confidence booster. After a pair of incidents a week ago left his racing operations in near shambles, the veteran driver came back with a strong performance to pick up the NASCAR Late Model win at Mid-Continent Raceways in Doniphan, Neb., on Saturday night. Humphrey would race pass race leader Mike Wiarda of Aurora, Neb., on lap 17 and then check out to win the 25-lap A-main. Steve Kosiski became the fifth different winner in five NASCAR Busch All-Star Tour events when he captured the AC/Delco ‘Mag 50’ at Sunset Speedway in Omaha, Neb., on Sunday, May 29. Kosiski started on the pole and from the start, set a torrid pace in the non-stop feature. 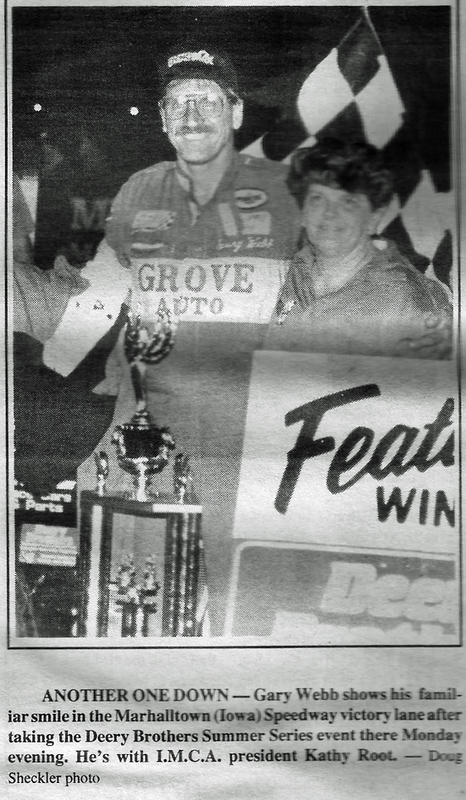 The winner was chased by several drivers – Randy McGraw of Marshall, Mo. ; Johnny Saathoff of Beatrice, Neb. ; Ray Guss Jr. of Milan, Ill. – over the course of the race. Gary Webb of Davenport, Iowa, who earlier had won the Busch Pole Award for his 18.193 second time trial, was fifth in the contest. Kossuth County Speedway in Algona, Iowa, was the site of the season opener for the MAC Tools Winner Series for IMCA Stock Cars on Memorial Day, May 30. An impressive field of 48 IMCA Stock Car from five states were on hand to christen the event. 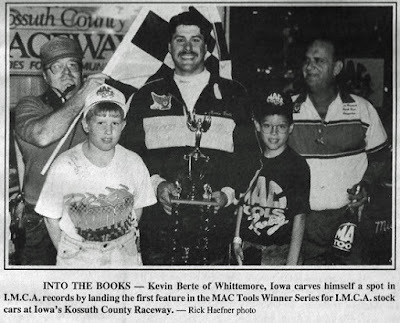 Kevin Berte of Whittemore, Iowa, who had to qualify through one of the B Mains just to make the 25-car starting grid, slashed through the field to take an impressive victory. 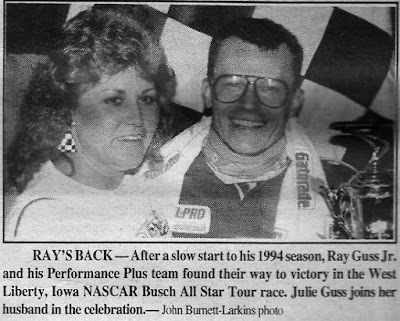 Ray Guss Jr. of Milan, Ill., proved “It’s never over ‘til it’s over” when he captured the NASCAR Busch All-Star Tour ‘Master Muffler 50’ at West Liberty /(Iowa) Raceway on Monday evening, May 30. 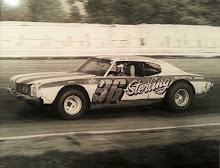 Steve Kosiski of Omaha, Neb., started on the pole position and appeared to be well on his way to the checkers after having successfully fended off Johnny and Jay Johnson, both of West Burlington, Iowa. But Guss, who started 11th, was steadily moving forward; fifth place on lap 37; fourth on lap 39; third on lap 41; second on lap 45. 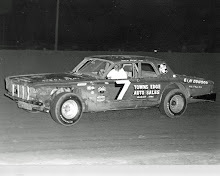 Then on the 48th circuit, Guss powered into the lead and held on for the win on the half-mile track. Jay Johnson would nip Kosiski for runner-up honors at the checkers. The IMCA Late Models celebrated the 100th running of a Deery Brothers Summer Series in grand style with an action-packed evening of racing at Marshalltown (Iowa) Speedway on Memorial Day. Many of the top drivers were on hand for the event but it was to be Gary Webb's night as he dominated the field and picked up his second Deery win of the season Webb would pass Denny Osborn of Waterloo, Iowa, on lap 10 and cruise from there to pick up the $1,000 paycheck. A tremendous battle ensued for the other top four spots with Ron Jackson of Danville, Iowa, Kevin Cale of Donnellson, Iowa, Darrel DeFrance of Marshalltown and Bryan Wanner of Winfield, Iowa, rounding out the top five.